From Batman’s Greatest Case, by Tom King, Tony S. Daniel & Joelle Jones, Tomeu Morey, and Clayton Cowles. By Zack Quaintance — Well, here we are, the second GIANT-SIZED celebration of a seminal DC Comics character in as many years, commemorated once again by a set of vignettes that clearly aimed at capturing 80 years of fictional superhero history via narrative. 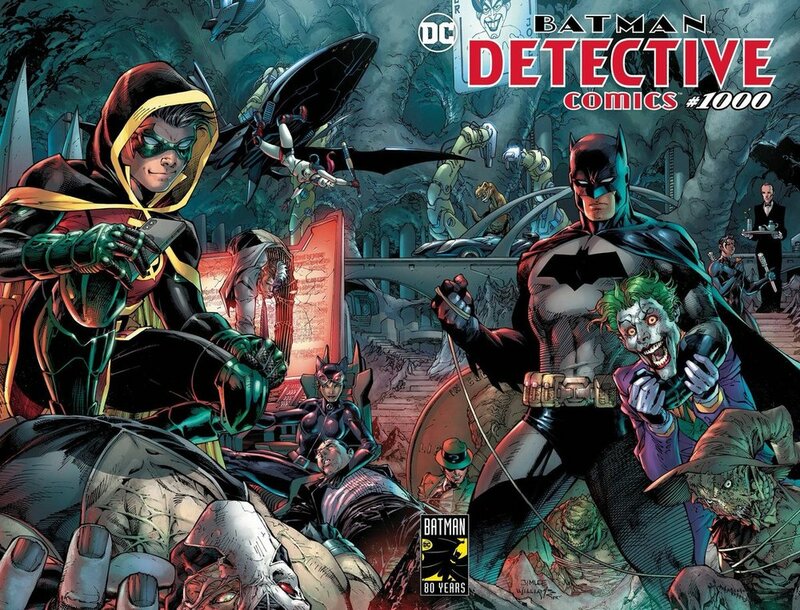 Detective Comics #1000 has arrived, bringing with it a set of creators old—Denny O’Neal, Neal Adams, Paul Dini, Jim Lee, Kevin Smith—and new—Brian Michael Bendis, Alex Maleev, Priest, James Tynion, Tom King. There’s a lot to unpack here, and, as I did last year with Action Comics #1000, I’m taking on the unglamorous task of trying to rank these stories in order of my favorite (it’s comics, someone will always vehemently disagree). But first! A word about what I liked and didn’t…. The Good: I mean, we got 10 high-production and ultra-focused stories about Batman, who is one of the richest characters in all of American fiction. The good sort of speaks for itself. We also got plenty of appearances from his rogues gallery, which is without question the best in all of comics. This story features one of the most well-known partnerships in all of fiction—Batman and Robin—depicting mainly what they both contribute to each other’s lives. It reads quickly, especially for a writer as keen on dialogue as Tynion, and sticks to the basics. Beautifully-rendered by one of DC’s best rising artistic teams—Martinez-Bueno and Fernandez—this is a quick bit of Bat-mythos that flies right by. It’s a credit to this whole issue that I found Manufacture for Use to be a weaker entry, because it’s not really very weak at all. It’s got Jim Lee depicting Batman running through his rogue’s gallery, which is worth the 10 or so pages alone. I just thought Batman’s goal (which I won’t spoil here) in this one was a little weak, or at least not as substantive as the story seemed to suggest. Still a nice little read, though. The Legend of Knute Brody gets to represent any and all goofy/campy takes on Batman over the years, and it does a decent job. It’s not as absurdist as Detective Comics got at its height during the late Golden and Silver ages. But it’s a fun romp that includes some of the Bat-family and some really clever work with the Bat-villains. It’s a nice touch of variety for this anthology, really. A sequel to a classic O’Neil-penned story from the Bronze Age—There is No Hope in Crime Alley—this one ranks as one of the most gorgeous story’s in the collection. In fact, it would higher if I didn’t find the ending to be so excessively cynical, an odd contrast to the far more optimistic ending in its prequel. But maybe that’s the difference between 2019 and 1976? Oof. The best-looking story in this collection, I Know by Brian Michael Bendis and Alex Maleev is so good it actually ups my excitement for the duo’s forthcoming work on an entirely different property, the Superman Leviathan story (event?). 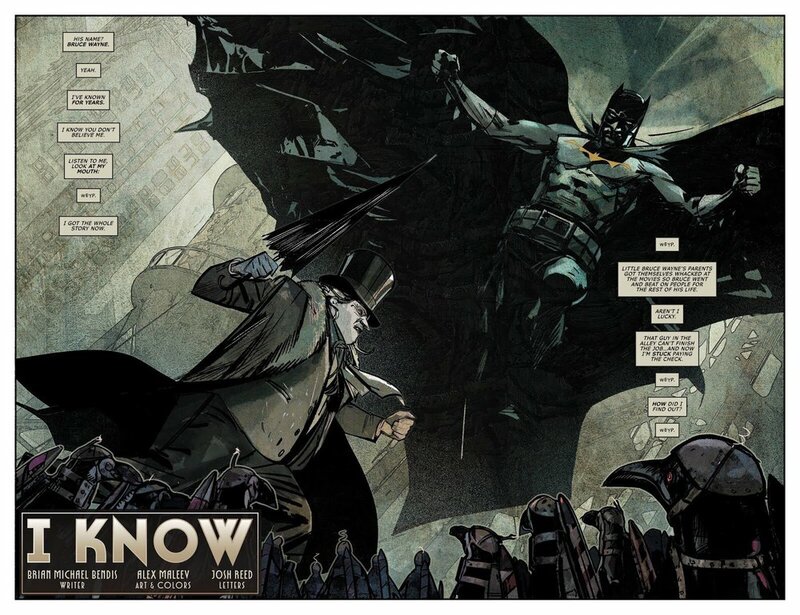 This short extrapolates the kernel of an idea into excellent character work for both Bruce and his rogues while simultaneously giving Maleev a chance to gorgeously render so much of Batman’s world. Weyp. Snyder and Capullo are my favorite Batman creative team, following their all-time great 52-issue Batman run that wrapped in 2016. And in this short, they hop right back into the alchemy they had there. This short also pays homage to the title’s past—Slam Bradley!—en route to adding something new to both Batman and the DC mythos. I also liked this story as a rare instance in which Batman is fallible, or at least doesn’t know everything about his contemporaries. SIDE NOTE: Call me a romantic, because I’m really liking the pairing of Hawkgirl and Martian Manhunter that has become a thing across titles in recent months. We see it again here in something as subtle as how they’re standing together when Batman finds The Guild of Detection. The most common wish fulfillment story for Batman over the years is one in which his parents are never murdered, he never becomes Batman at all, and he grows into a wealthy (if simple) philanthropist. That’s fine, but a bit backwards facing. What we get from Johns, Jones, Madsen, and Leigh here is a story that accepts traumas of the past, and instead idealizes Batman’s future. I don’t want to go into spoiler territory so I’ll stop there, but I will note I found this to be the most emotionally impacting work in this volume, a nice surprise to come across that took me a moment to orient myself within. Very well done. Look, I worship every Wednesday at the Church of Warren Ellis (The Midnighter is the pope...it’s awesome), so I was predisposed to like this one, but holy wow did it blow away my expectations. This is, quite simply, the best bit of visual storytelling in the collection. Moreover, it just perfectly balances so much of Batman’s character within the small space at its disposal, the mindset, the gadgets, the preparation, the motives, the terror...it’s all there. It may seem (on its surface) a bit too simplistic for some, or even a bit too cheery (weird as that sounds), but I’d urge a closer look. The Batman’s Design is smart and layered and exciting and just about as good as a short superhero comic can get. I’d say give these two their own 104-issue Batman run, but they’ve already told a nigh-perfect Batman story in just 10 pages. As with my Action Comics #1000 review, I took this last one out of the running because it had the unfair advantage of leaving itself open ended. All the same, I thought this was kind of an odd choice of vignette, because it used only one page splashes (which looked gorgeous!) and didn’t really have a narrative, functioning more as a teaser trailer for Tomasi’s next arc, which is just fine. I will, of course, be reading that (even if not being a gamer I have no idea whatsoever who or what The Arkham Knight is).